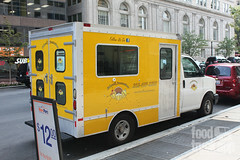 Add another taco truck to the stationary cart list in Ballston, because Taco Carrito is on the scene. As for the roving trucks, they’re mostly sidelined because of the rain today, but at Curbside Cupcake you can get their rainy day special – two cupcakes for $5. That’s enough to make you smile, right? Can you guys please check the trucks before posting this, or re-confirm your “never-move” status for purple spots? The yellow bulgogi truck is not there today. A clearly did not have an umbrella today!